Rabbits with completely blocked windpipes were able to stay alive for up to 15 minutes without a single breath after researchers injected tiny oxygen-filled microparticles into the animals' blood stream, in a "potential breakthrough" that may help save many lives in the emergency room. Researchers at Boston Children's Hospital have come up with a way to bypass the lungs and deliver oxygen to the bloodstream of patients who cannot or have stopped breathing by using injectable oxygen. Patients who stop breathing, may it be from an obstruction in their airway or acute lung failure, need another way to get oxygen to their blood fast or risk going into cardiac arrest or serious brain injury. Scientists believe that the new technique has the potential to hold off injuries like cardiac arrest, brain injury and cerebral palsy induced by oxygen deprivation. Previous attempts to treat hypoxaemia or low oxygen levels in the blood and other related conditions like cyanosis with oxygen injections have had varying degrees of success, mainly because these past methods of injection free oxygen gas directly into the bloodstream can be dangerous because free oxygen gas can accumulate into larger bubbles and form potentially lethal blockages in the body called pulmonary embolisms. However a new study, published in the Science Translational Medicine, has found a way around the danger by injecting the body with oxygen in liquid form. Lead author Dr. John Kheir, of the Department of Cardiology at Boston Children's Hospital, and colleagues designed a lipid foam infusion of microparticles that consists of a single layer of lipids or fatty molecules that surround a tiny pocket of oxygen gas. Researchers explain that once the solution is injected, the gaseous oxygen will still be contained and suspended in a liquid mixture to prevent it from getting to other oxygen particles to form larger bubbles. Kheir said that the particles are injected directly into the bloodstream where they will mix with circulating red blood cells, allowing the oxygen to diffuse into the cells within seconds of contact, according to Nature. "By the time the microparticles get to the lungs, the vast majority of the oxygen has been transferred to the red blood cells," Kheir said, according to Nature. 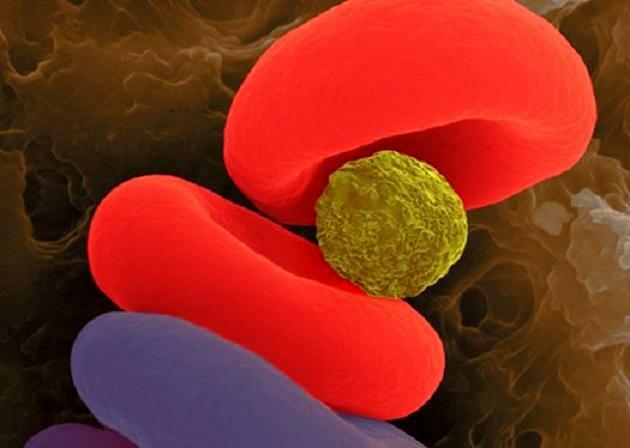 Researchers say that oxygen-filled microparticle solution is different from the other various types of artificial blood currently used in medicine because while they can carry oxygen around the body, they still need to receive oxygen from the lungs. Kheir said that the lipid foam solution is safe because as the oxygen leaves the bubbles, the shells buckle and fold and the fatty molecules break off and are reabsorbed by the body. Kheir and his team had injected rabbits with the liquid solution and found that the animals were able to be kept alive for up to 15 minutes without breathing. The animals also had normal blood pressure and heart rate, and showed no indication of heart, lung or liver damage that is usually caused by oxygen deprivation or pulmonary embolisms, which can happen if free oxygen gas is injected into the bloodstream. "Essentially as soon as we started injecting it, clinically we started to see an effect," Kheir said, according to Science. However, he noted that when the injection stopped, the levels fell just as quickly, meaning that the microparticle-solution must be continuously administered. Researchers said that the microparticle solutions are cheap to make, portable, could stabilize patients in emergency situations, and make time for doctors to perform other urgent life-saving therapies. "This is a short-term oxygen substitute—a way to safely inject oxygen gas to support patients during a critical few minutes," Kheir said in a statement. "Eventually, this could be stored in syringes on every code cart in a hospital, ambulance or transport helicopter to help stabilize patients who are having difficulty breathing." However he noted that the microparticles should only be administered for a maximum of 15 to 30 minutes, because they are carried in a solution that is mostly comprised of liquid, and the fluid would overload the blood if used for longer periods. "If we could increase the ratio of microparticles to fluid, we might be able to use this for even longer, and even more indications," Kheir said, according to Science. "This is a potential breakthrough," says cardiac intensive care doctor Peter Laussen of Boston Children's Hospital, who was not involved in the work. "You can apply this across healthcare, from the battlefield to the emergency room, intensive care unit, or operating room."